I had a documentary-style dream last night where I'm sitting there explaining a story about how I entered a recording studio one morning for a session with my band (which doesn't exist YET), and the owner comes up to me and is like, "Hey, were you guys expecting a phone call from someone?" And I'm like, "Not that I know of." And he goes, "Well, somebody pretty famous called in and said she's doing a new album and she wants to collaborate with some contemporary artists. She asked if you guys would be interested." So I say, "Who is it?" And he goes, "Yoko Ono." And according to me, I instantly said "I'm in." And then it cut to Yoko and my band jamming in the studio in New York and having a blast. After the session is over, I'm sitting alone with Yoko at the mixing deck, asking her questions about her life with John, the 60s, the media, etc. And when I finally have to go, she gently grabs my hand and tells me how much she appreciated us coming out and she had a great time and she has something she'd like to give me. So of course I'm eager but nothing could have prepared me for what it was: she hands me a cassette tape and says it's an unfinished John demo--never been bootlegged or heard by anyone besides her and Sean--and asks if I would like to complete it. Naturally, I'm beyond honored and graciously accept the opportunity. ...but like 2 seconds in, the dream ends. It was such a cruel tease. So John, if you're out there listening to this, please feel free to return to my dream world and let me hear the entire thing. I'll share the royalties, man, that's fine. Actually, John was not born with bad eyesight... his eyes started going bad around the age of 7. Besides, of course he inherited the near-sighted and/or astigmatism trait... but how do you know that his myopia didn't manifest itself because of trauma? You can't prove that it didn't, can you? Well, since myopia isn't in any way a new condition and has been studied by medicinal scientist for centuries without documenting a psychological link, then yes, it seems pretty certain it's physical. I've never heard of anyone becoming myopic due to trauma! MOST people that are nearsighted are discovered to be thus around when they start school, which tallies with John's seven years of age. It's when you begin reading and have to cope with a blackboard far in front of you that myopia truly matters. Ask anyone with that eye condition and they will agree with that. The Hey Jude line "Don't carry the world upon your shoulders" applies as much to John as it did to Julian. Instead of just accepting his myopia as something he couldn't help, he MUST start thinking it's mental and that he's somehow to blame. I hate when he did that to himself! My myopia started at school too and I often copied from my neighbour because I couldn't read properly on the blackboard. When I was 20 years old I just had to wear glasses while taking driving-lessons, although I hated it. I still hate wearing glasses (probably even more than John did), that's why I'm wearing lenses. Although neither of my parents suffer from myopia, I can't imagine that I'm myopic due to some mental causes or trauma. Further, I think it's wrong to search for every physical illness or weakness a psychic explanation. Okay, somewhere I mentioned that the New York Times refers to John as simply "Lennon" in some articles, even though their practice has been to refer to people previously mentioned as "Mr. So-and-So." I attribute this fact to John's iconic status... but who knows the real reason. Okay, before you go saying that maybe there's no Mr. in front of John because he's dead whereas "Mr. McCartney" is still alive, George is also referred to as "Mr. Harrison." Well, I don't know what to say....Don't know if not giving him the honorific "Mr." is a compliment or a sneer! I am reminded, though, of something John said around the time he was being excoriorated for his relationship with Yoko and their peace campaign: "The problem, I s'ppose, is that I've spoilt me image. People want me to be cuddly. But I was never that. Even in school I was just 'Lennon.' I was never cuddly!" Well, if it was put-down or a sneer, then you'd expect them to do the same with Yoko, right? But they refer to her always as Ms. Ono. I did a search... Gandhi is almost singularly referred to as simply Gandhi and MLK is called always Dr. King, which makes sense since he was a Dr. and it would come off as disrespectful, I suppose, to refer to him as just King. "People want me to be cuddly. But I was never that. Even in school I was just 'Lennon.' I was never cuddly!" He was the best type of cuddly... seemed rough on the outside, but really just a big softie. So John, if you're out there listening to this, please feel free to return to my dream world and let me hear the entire thing. I have remorseful dreams quite alot. Weather it be buyers remorse over a house or car or wrong life paths that I have chosen. If it's not that it is the I'm naked in public dreams which is very common. Also the falling dreams, weather it be falling down an elevator shaft or a well or a canyon, they are all similar. Last edited by J.Winston.L : May 06, 2012 at 01:22 PM. Well, MLK's last name is also a noun. And any grown male can be Mr., but it takes some effort to be a Doctor of anything. I was just joking about it being a sneer... I think just referring to the man as "Lennon" does indicate iconic status. When they write about Elvis Presley, do they call Elvis "Mr. Presley" or just "Presley?" Or maybe they just call him "Elvis?" Anyone know? I'm betting they just call him "Elvis." Elvis Costello, on the other hand, is probably referred to as Mr. Costello. I have some vivid dreams but they rarely involve celebrities of any kind. So I think John's ideas weren't as "out there" as some of you may think. He just didn't study it deeply, so he articulated it superficially. John was a dilettante in that way... and I loved that about him, because he never claimed to be an expert, but he knew a little about a lot. This. I completely agree. For most of John's "controversial" quotes, there's even just a grain of absolute truth- and sometimes it takes a little experience for me to see it. I understand what he was trying to say, just as I feel that his view on cancer being the result of some kind of inner pain that manifests itself in this way...he seemed to have a philosophy for so many things that many people just accept as plain fact. I love and deeply appreciate that about John. I don't always agree. But I love that he chose to consider this or that and didn't just accept whatever plate society handed him. "There were the Beatles, and there was John. As a band, they were a great unit. But John, he was his own man." And what a man indeed. 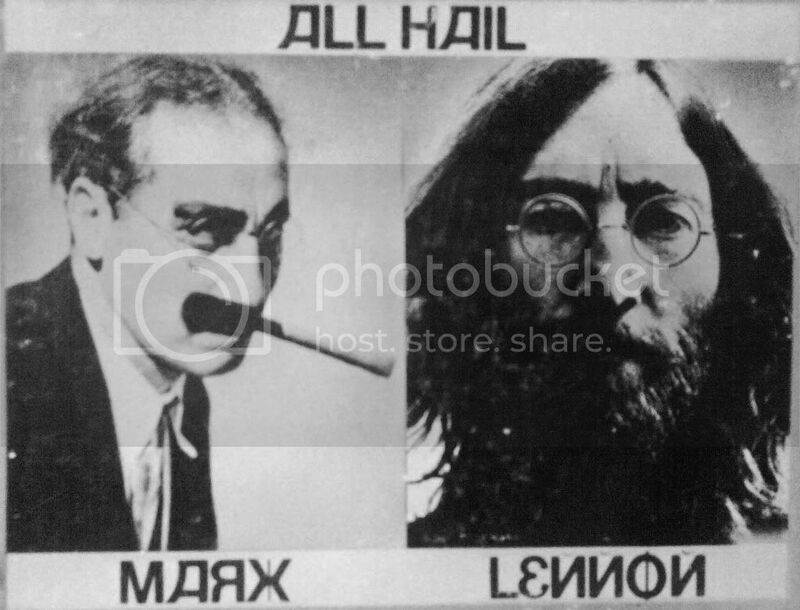 Maybe because the New York Times knew along that with Groucho Marx, John Lennon too was a communist. That's what I claim on my FB page about my political philosophy, anyway! Today I saw a marquee for a local Italian restaurant that says "Give pizza chance." Oh c'mon Maia, you don't want me to believe that John's eyes got suddenly worse at the age of 7, do you ? Unless you had any operation near the eye you are born with astigmatism and in most of the cases it's combined with myopia. You can look this up in the Wikipedia. I read that Mimi noticed that John often stumbled when he learned to walk as a toddler and she brought him to the doctor when he was 5. He told her that he should wear glasses (of course John refused). Nowadays it's not a problem anymore, you can fix it at young age. Besides, I don't have to prove that myopia manifests itself because of a trauma; I never heard about such cases. Actually, you are the one who has to prove that there exist some evidence for your speculation. i dont knoe if this exactly fits here. but. Oh c'mon Maia, you don't want me to believe that John's eyes got suddenly worse at the age of 7, do you ? Yes, I DO expect you to buy it... because it's true. And, as someone who suffers from myopia herself (though not nearly as serious as John), I can tell you that MY near-sightedness came on very suddenly... at age 16! In fact, very few people are myopic from infancy... the vast majority of us develop it in childhood, in adolescence, or even in adulthood.... some people as late as their 40s or 50s! Look it up. It's a FACT. And I don't have to prove anything... because I just feel it's possible. YOU are the one who is CERTAIN... and if you're gonna be certain about your opinions, then you better have some evidence to back it up! Hey, I lost 60% of my hearing in my left ear overnight, not due to anything in particular! (No, I didn't have some loud noise suddenly go off next to my ear the night prior!) I had onset of myopia and astigmatism at age 12. Due to emotional trauma? That's the main point here. I was diagnosed as myopic at age 4. Unlike John, however, scarlet fever at two years old caused my condition. When I started working for him in 1976 I wore round metal frame glasses. But I didn't want to seem like a copycat (which I was), so I quickly changed to clear plastic frames. About two years later, John changed to plastic frames and I immediately went back to wearing metal frames. Kinda' funny! I didn't realize all this until after his death, when I started writing about my experiences at the Dakota. Last edited by Mike Tree : May 08, 2012 at 12:38 PM. or so she said. But then I seem to have inherited poor eyesight from her, and I never had measles, so who knows? I think there is such a thing as a mind-body connection, but I don't know if it's as obvious as John's statement on myopia made it sound. If one has major stress or went through some sort of trauma, emotional and/or otherwise, the body expends a great deal of energy that then is not used to perhaps keep other bodily functions in check. Of course, John's early life was rather stressful and emotionally confusing. If one is genetically predisposed to poor eyesight anyway, the energy one expends on just trying to cope with stressors might weaken whatever it is that is keeping your eyesight sharp. My myopia/astigmatism surfaced during puberty, which is pretty darn stressful physically and emotionally. So maybe that had something to do with it. However. I don't think any amount of therapy's gonna change it! I've been in therapy and I still need glasses!